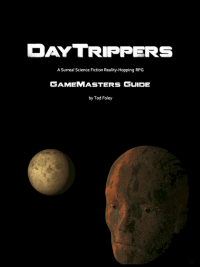 DayTrippers Hangout Session number 5 is the beginning of a new character and a new campaign, GM'd by Tod Foley and starring Abstract Machine as "Space Monkey". 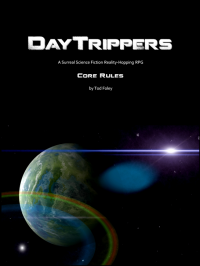 DayTrippers Hangout Session 5 - "Shock the Monkey"
We spend a little time talking about the character build for Space Monkey, who we will refer to as "Spacey". Diane awakens Space Monkey at 3:30 AM; dresses him in a hurry and drives him to Diaspora Ranch. Along the way she babbles about how this is crazy, wishing someone else was available, but it is a lot of money, and we have to save "that poor man". Tracy Island is locked down, with minimum launch crew. A tall blonde woman in luxury garments is calling the shots. Diane bribes Spacey with snacks to get him to don his survival suit. The ship is large, with a capacity of 8. Spacey is told there are six people missing, and his job is to bring them back. Diane gives him some chocolate bars from a nearby vending machine and promises him a big bunch of bananas when he returns. Spacey slips out to the destination planet, "Cetus Alpha 2b". He materializes in a dense jungle, teeming with life. In a large clearing he sees the other ship; tan in color, it has a large hole in the left rear part of the hull; it was shot down out of the air. A bald man and a red-headed boy in tan-colored flightsuits come out of the ship, they look at Spacey and burst out laughing. A white-haired woman is arguing with the bald-headed man, who seems to be the alpha around here. It seems the woman - who is called "Doctor Howell" - wants to go up to a nearby mountain. The other crew members come out: a short red-headed woman named "Lang" and a burly tattooed man called "Kelley". The humans all seem to be arguing, and the crew convinces the bald man - whom they call "Captain" - to head up the mountain. Apparently this is the direction they believe their missing crewmember to have gone. The crew encounters a group of spider-like creatures with micro-fine whips on their forelimbs. Spiders and whips both disturb Spacey. He beats the ground and warns the humans while the first of the creatures attacks the red-headed boy; they lacerate his legs as they begin to climb up his body. Spacey has a flashback which reminds him of the checkered history of animals in space; the violent traumas they have undergone. He feels a sense of class consciousness, blaming the "invisible alphas" who remain safe on Earth while sending other creatures out to do their dirty work. He extends this new understanding to the humans around him, and feels a bond with them. After one failed attempt, Spacey grabs the boy and shakes the creatures off him while the rest of the crew stomps them into the ground. The boy is unconscious. There's tension between the Captain and the Doctor. Spacey gets both of them to hold his hands, calming them both. The group comes to a trail that veers off into a nearby rift, marked by etched lines in the ground. The Doctor takes photos. Kelley and Lang are sent to investigate; Spacey climbs a tree to observe the area. The Captain and the Doctor seem to be sharing a tender moment. A paved trail goes down the other side, leading toward some ancient and water-logged ruins, overgrown with grass, roots and vines, probably thousands of years old. Spacey hears a metallic sound from a neighboring peak, like some great machine moving; the humans don't notice it. Spacey howls and clambers up a nearby tree. From that vantage point he sees a massive turret - disguised as part of the mountain - which aims at the humans and fires a large projectile. It misses, taking out several trees. The humans scramble down the east side of the mountain, heading toward the ruins. Spacey swings through the trees and takes a look at the turret, now motionless. He climbs up to the window from beneath it, and climbs into the turret. During his mechanical training Spacey was taught to fix tanks. Because of this he identifies this machine as a mounted cannon, driven by a computer, which is connected to a sensor. He finds some sheafs of a paperlike substance. He stacks some of these papers in front of the sensor to block its view, and shoves a few more into his suit. He then follows the metal rail which leads down through the floor and into the mountain. Something is coming up the tunnel: it's a machine riding the rail. Spacey climbs the wall and it passes beneath him. It's a robotic vehicle carrying a large shell, going up to reload the gun. Following it back into the turret, he tries to remove the shell from the loader but fails, and the shell slides into the chamber. Grabbing a nearby piece of metal, Spacey smashes the sensor lens. Looking toward the ruins through the window, Spacey can see Kelley standing guard outside one building; the rest of the crew seems to have gone underground, where most of the city is found. Spacey goes back down the tunnel, coming to a large room full of robots. As he crosses the room one of them turns toward him. It tracks him as he jumps in and out of the room, firing a weapon at him. Spacey is hit in the shoulder and hurriedly continues on his way deeper into the ruins. The robot does not follow. Spacey goes deeper into the ruins, passing crumbled walls, busted machinery and flooded hallways. He passes a floating sphere in one room, which emits a high-pitched buzzing sound. He passes some areas where side-passages have been sealed over, and eventually hears human voices ahead. Spacey rejoins the group. The boy ("Briggs") is conscious but needs help walking. There's tension in the group again. Spacey pantomimes everything he's seen on his trek down here. He hands the papers to the Doctor, who is delighted with them. The humans don't understand what he's trying to say; the Doctor wants to go back the way Spacey came from, but the Captain refuses to permit it. Spacey takes the Doctor and Captain by the hands, and the group stays together. It gets darker and wetter as they go deeper; flashlights are brought out. More sealed passages are found. Up ahead Spacey notices a glowing green light. It's coming from a gigantic underground amphitheater; in the center on a raised dais is a throne-like chair facing a glowing green ball of energy floating above a pedestal. Beside the throne is a cabinet with switches and a lever. Spacey runs ahead, climbs into the chair, flips the switches and pushes the lever. The green light changes into a vision, floating in mid-air: It's the simulator at Tracy Island; he sees Diane crouching to open the door, she has a banana in her hand, and when the door opens, it's not Spacey that emerges, but *another* monkey. The image then fades. The rest of the crew saw it too. The Captain orders him to come down from the chair. Spacey stops to think about his relationship with Diane and the invisible alphas. He is beginning to recognize that there are different levels of status in all these relationships. He's beginning to see the power structure that he's part of. He wonders where his loyalty should belong, and he decides that - at least for now - it's with these people right here. Spacey pulls the lever again. Again the green ball expands into a moving image: This time it's a vision of Spacey himself, very very big, and he's pushing the Captain over a cliff. When the real Spacey tries to grab the image of the Captain, preventing him from falling, the image stops immediately. The Captain, now fearful, draws his weapon and points it at Spacey, ordering him to come down. Spacey clasps the Captain's and Doctor's hands again, smiling. Suddenly a large explosion is heard from the remote distance, in the direction of the ships. The group hurries back to the surface; Kelley is nowhere to be seen. They head back over the mountaintop and approach the ships. There is a plume of smoke rising from that area. Spacey tracks Kelley's footprints and determines that he headed that way. The rear engine of the Corillia is smoking, on fire. Kelley is crouched behind the rescue vehicle, hiding from someone. Spacey climbs up into the trees and spots the assailant - a curly-haired man named Danton - sitting in a tree across the clearing. Both men are trying to get a shot at the other. Moving through the trees, Spacey circumnavigates the clearing and moves quietly to a spot above the curly-haired man, falling upon him and knocking him out of tree. The Captain and Kelley hold Danton and tie his wrists behind him, marching him toward the rescue ship. The Doctor glances wistfully back at the mountain. Spacey logs the ship's coordinates. Kelley looks back with sadness at the downed ship, almost moved to tears, before joining Spacey in the cockpit. The Captain and the Doctor are having a soft conversation in the back. Spacey programs and executes the slip home. Upon exiting the ship, Danton is hauled away by men in black suits. The Captain suddenly ignores the Doctor and embraces the black-clad woman, calling her "Corillia". Spacey signs to Diane: Now that he's an alpha male, he says, he wants mates, and he wants his own ship. Diane placates him, giving him a gigantic bunch of bananas. As a parting gift, the Captain gives Spacey a tee shirt, tan in color, with the Corillia logo on it.